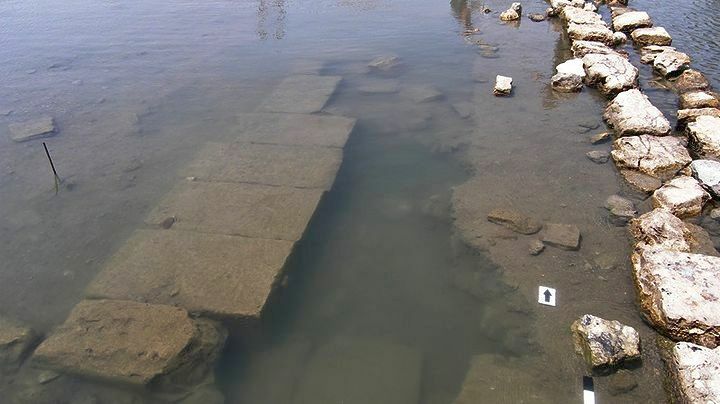 An underwater ruin that could be the remains of a public building situated near the port of Salamis in antiquity – possibly one seen and mentioned by the traveler and geographer Pausanias in the 2nd century AD – is gradually emerging following an archaeological investigation of Ambelakia bay near the island. 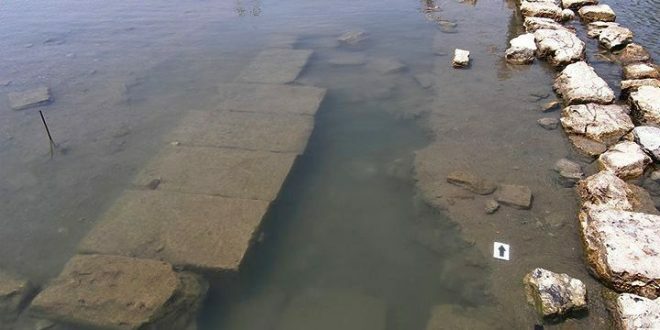 A culture ministry announcement issued on Monday said that a large and robust structure constructed of stone plinths, roughly 13 metres long, is traced in the mud beneath the water. The find is located a short distance from the more contemporary 48-metre pier, built before 1900 using ancient building materials, that stands out in the northern section of Ambelakia bay. 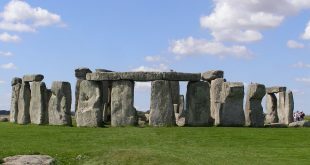 “It is, in all likelihood, the base (with strong localised foundations in its southern section) of a public building construction,” the announcement said. The shape of the foundations, other architectural elements and movable finds located on the site, combined with the earlier nearby find in 1882 of a marble pedestal for a statue with a dedicatory inscription, lead to the initial conclusion that the building was either a temple or stoa used in the later Roman era but possibly built earlier, in the late Classical or Hellenistic eras. The new finds were revealed during the second phase of a underwater survey along the historically important eastern coast of the island of Salamis, taking in the Ambelakia bay, the port of the Classical-era city of Salamis controlled by Athens, which served as the main gathering place of the united Greek fleet before the Battle of Salamis in 480 B.C., as well as the region off the Kynosoura peninsula in the north of the island, where the most important Nike monuments are situated. 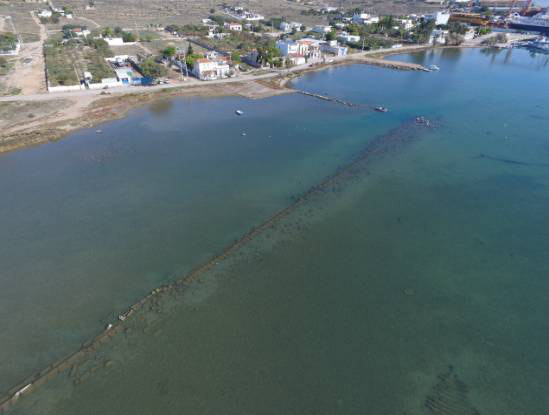 The geophysical survey in the Kynosoura area yielded a “large volume of high-quality digital data, whose processing is expected to shed light on the paleogeographic development of the region and the location of targets of archaeological significance,” the ministry announcement said. 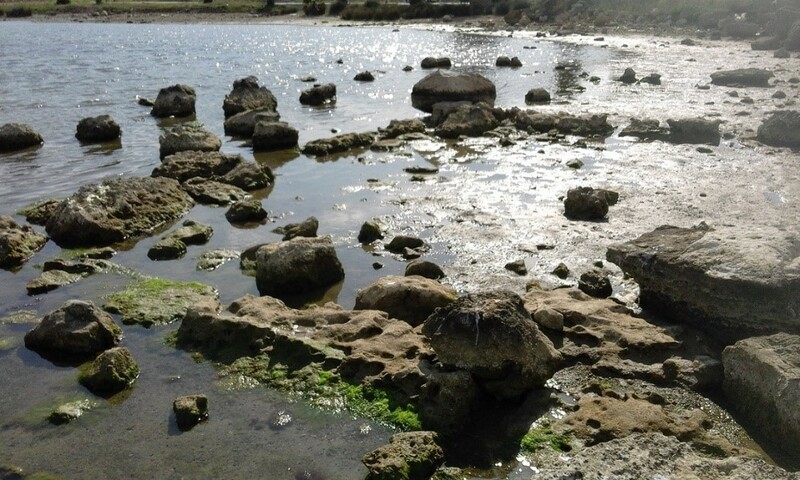 The aim of the research is to trace the Classical-era coastline of the island and put together the region’s coastal paleogeography, while also revealing possible archaeological finds resting on the seabed or hidden beneath it. It is part of a three-year cooperation programme between the Underwater Antiquities Ephorate and the Institute of Underwater Archaeological Research (IENAE), led by Dr. Aggeliki Simosi and Ioannina University professor Dr. Yiannos Lolos, with the participation of the Patras University’s Laboratory of Marine Geology and Physical Oceanography. Marble fragments of an altar (left) and statues from the Roman times, found in a big building on the north side of Ormos. 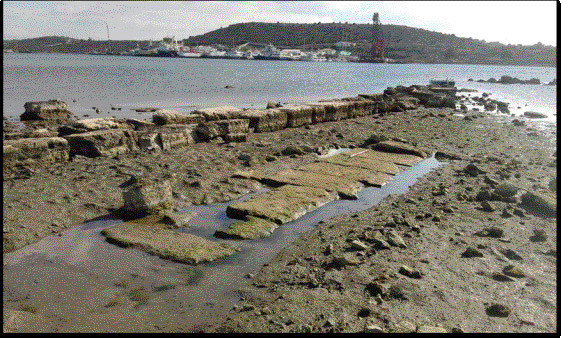 A sunken part of a big public building (left) at the port of the ancient city of Salamis on the north side of Ormos. Pausanias (c. AD 110 – c. 180) was a Greek traveler and geographer of the 2nd century AD, who lived in the time of Roman emperors Hadrian, Antoninus Pius and Marcus Aurelius. He is famous for his Description of Greece (Ἑλλάδος περιήγησις Hellados Periegesis), a lengthy work that describes ancient Greece from his first-hand observations. [1.35.2] Salamis lies over against Eleusis, and stretches as far as the territory of Megara. 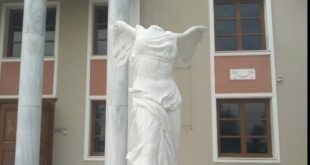 It is said that the first to give this name to the island was Cychreus, who called it after his mother Salamis, the daughter of Asopus, and afterwards it was colonized by the Aeginetans with Telamon. 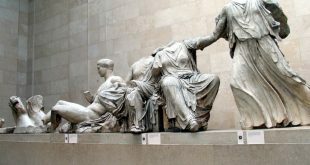 Philaeus, the son of Eurysaces, the son of Ajax, is said to have handed the island over to the Athenians, having been made an Athenian by them. Many years afterwards the Athenians drove out all the Salaminians, having discovered that they had been guilty of treachery in the war with Cassander, and mainly of set purpose had surrendered to the Macedonians. They sentenced to death Aeschetades, who on this occasion had been elected general for Salamis, and they swore never to forget the treachery of the Salaminians. Aerial picture – Ancient Ruins sunk in Ambelakia Bay.